To help answer this question or any other questions, the Diocese of Tucson’s Director of Vocations, Fr. Jorge Farias Saucedo, visits the Newman Center on occasion and is available to meet. He can be contacted with questions at vocations@diocesetucson.org. In addition, any of the Newman Center staff is willing to guide you as you listen for God’s voice and respond to his call. 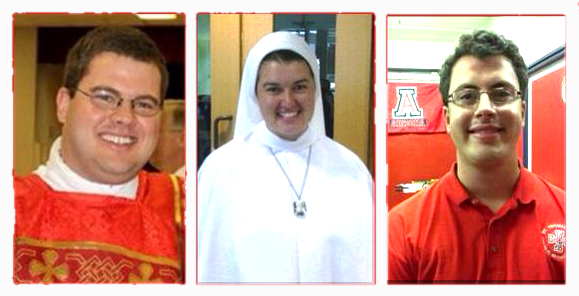 The Newman Center is committed to praying for those who are currently in the seminary or the novitiate, including the following U of A and Newman Center Alumni: (from left to right) Deacon Chris Axline (Diocese of Phoenix), Mary Ruth Culver, now Sr. Bernadette Therese (Dominican Sisters of Mary, Mother of the Eucharist) and Paul Grandi (Diocese of Tucson). Loving and generous God, we need more vocations to the priesthood. Send us faith-filled servants to minister as dedicated and loving priests in the Diocese of Tucson. Inspire us with your Holy Spirit so that we will encourage and foster a culture of vocations in which many will hear your call to serve your people. Bless our Diocese with men and women who will work together with your priests as deacons, religious, and lay ministers to bring to life the Gospel and to realize the Church’s mission in our Diocese. We ask this through Christ our Lord. Amen.